Ornithogalum divergens Boreau (syn. : O. umbellatum subsp. divergens (Boreau) Bonnier et Layens, O. paterfamilias Godr.) (S and C-Eur., SW-As.) 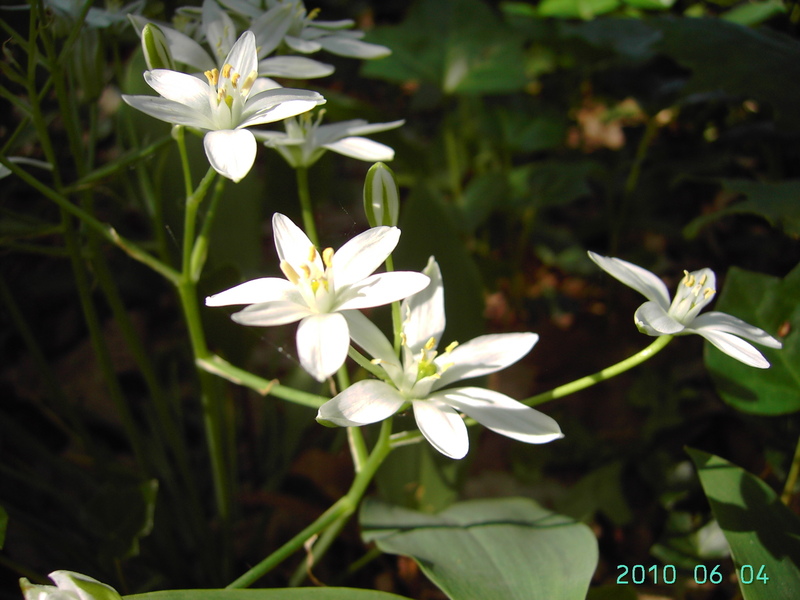 – This is a little known and rather poorly circumscribed species, closely related to native Ornithogalum umbellatum. Its taxonomic status was long controversial: although often subsumed under the latter (usually as a subspecies; e.g. Stace 2010, Lambinon & Verloove 2012) it was sometimes given specific rank as well (see for instance Zahariadi 1980, Stace 1997, Garbari & al. 2007). Recent studies have confirmed that it is best accepted as a distinct species (e.g. Martínez-Azorín & al. 2009, Martínez-Azorín & al. 2014; see also Tison & de Foucault 2014). Typical plants are regularly observed in Belgium, at least since 1919 (De Langhe 1977). They often grow near gardens or churchyards, for instance around Antwerpen and Brussel and in the Kempen. Since it is poorly known, its exact distribution and degree of naturalization are unknown. However, it is hardly cultivated in gardens these days and plants now found can probably be accepted as more or less naturalized. It usually occurs in rather small populations but these appear to be very persistent. It may well have been widely overlooked as a result of confusion with Ornithogalum umbellatum. As a rule, this taxon is distinguished by a combination of several features: lowermost pedicels are longer (up to 12 cm long, patent to deflexed at maturity), bulbs are surrounded by numerous (sub-)spherical, much smaller bulbils, leaves are often wider and longer (up to 8 mm wide), inflorescences have more flowers (often more than 12), etc. However, this species and Ornithogalum umbellatum are only reliably identified on bulb characters (Tison & de Foucault 2014). Plants with more or less intermediate aerial features, even within one population, may be observed. 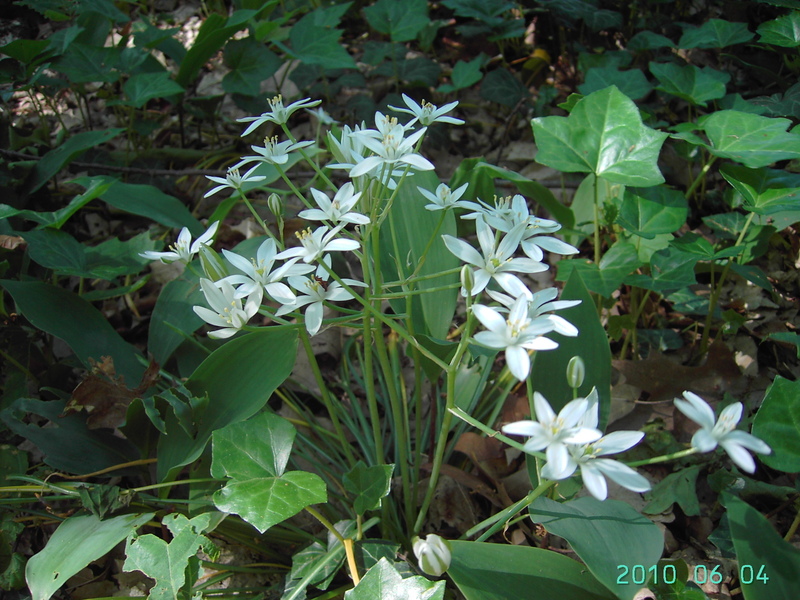 Additional research on Belgian populations of Ornithogalum umbellatum s.l. – especially on those found in man-made habitats – is required for a better understanding of the actual presence and distribution of this species in Belgium. De Langhe J.E. (1977) Notes floristiques. (Floristische Notizen.). Bull. Soc. Roy. Bot. Belg. 110(1-2): 37-38. Gadella T.W.J. (1970) Enige aantekeningen betreffende Ornithogalum umbellatum L., Gorteria 5: 18-19. Gadela T.W.J. (1972). Some notes on Ornithogalum umbellatum L. and Ornithogalum divergens Bor. Acta Bot. Neerl. 21: 257-260. Gadela T.W.J. & van Raamsdonk L.W. (1979) Ornithogalum umbellatum L. en O. divergens Bor. in Nederland. Gorteria 9: 273-277. Gadela T.W.J. & van Raamsdonk L.W. (1981) Biosystematic studies on Ornithogalum umbellatum L. s.l. Bol. Soc. Brot. ser. 2 53: 745-791. Moret J. (1987) Apport de la taxonomie numérique à la connaissance du genre Ornithogalum L. au Maroc: relations entre les sous-espèces d' Ornithogalum umbellatum L. Bull. Soc. Bot. France Lett. Bot. 134(2): 155-163. Moret J. (1991) Les stratégies de reproduction du complexe polyploïde Ornithogalum umbellatum (Hyacinthaceae) en France. Adansonia 13(1-2): 25-46. Moret J. (1992) Numerical taxonomy applied to a study of some ploidy levels within the Ornithogalum umbellatum complex (Hyacinthaceae) in France. Nord. J. Bot. 12: 183-195. Moret J., Favereau Y. & Gorenflot R. (1991) A biometric study of the Ornithogalum umbellatum (Hyacinthaceae) complex in France. Pl. Syst. Evol. 175(1-2): 73-86. Van Raamsdonk L.W.D. & Heringa J. (1988) Biosystematic studies on the umbellatum-angustifolium complex in the genus Ornithogalum (Liliaceae). 3. Morphological analysis. Nordic J. Bot. 7: 631-637.